According to the Daily Mail, Manchester United will demand around £35m from the clubs that are looking to sign 28 year old Armenian international, Henrikh Mkhitaryan. This move is seen as a confirmation of the unrest between the player and manager, José Mourinho and the relationship between both men is believed to have soured without repair. Mkhitaryan has failed to make the matchday squad in eight of the last nine games, and reports suggest that the club may be willing to let him go by replacing him with Real Madrid player. 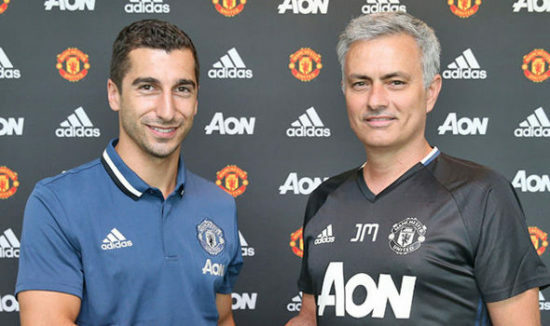 Mkhitaryan only joined United last summer but has endured a topsy-turvy relationship with manager, Jose Mourinho. The Portuguese tactician is not really enamoured of the former Borrusia Dortmund midfielder, as his workrate and general attitude without the ball is not the best. Despite a strong start to the season, he has dropped off in recent weeks, with reports suggesting that both men fell out yet again after the playmaker disagreed with some of his statistics from a video analysis session. Inter Milan are looking at signing the player, but United will demand more than the £27m we paid for his services some 18 months ago. The player endured a torrid time at Old Trafford last summer due to a bad debut in the Manchester derby and he had to wait for three months before his next start, eventually taking off from there, establishing himself as one of the first names on the teamsheet and being a vital member of our run to winning the Europa League. The player’s ability is not in doubt, but he doesn’t look like the perfect player to adapt to our coach’s philosophy. Inter Milan have been brilliant this season in the Serie A, as the Nerrazurri are in second place, with only one loss in 17 matches under Luciano Spaletti. Mkhitaryan is an attacking midfielder known for his movement, passing, intelligence and finishing. He has enjoyed a fine career till date, playing for the likes of Shakhtar Donetsk and Borrusia Dortmund, and becoming the link between the midfield and attack. He looks set to leave The Theatre of Dreams, but he can still dig deep and prove he is worthy of playing for such a glorious club like ours.